If you have an Android phone or tablet that is no longer in use and gathering dust, selling it or giving it to a new owner is often a good idea. Before you do that though, you’ll almost certainly want to erase all personal data on the phone by resetting the Android to the factory default settings. This is frequently encountered by those who use both platforms, but also for those who are moving from Android to an iPhone. You’ll probably want to copy your pictures, contacts, and other important data from the Android before doing this if you haven’t done so already, particularly if you’re migrating over to an iPhone. Moving contacts to an iPhone from Android is quite simple with this method, though if you’re going to juggle both iOS and Android platforms you may want to use Google Sync instead. Much like resetting an iPhone to factory settings, once the Android is erased and reset, it will boot back into a setup process that is ready for a new owner or fresh configuration. Clearing all data off an Android phone is quite simple and the process is generally the same regardless of which version of Android software the phone is running, though there an be slight variations in what menu options you’d need to select. This works the same on basically all Android smartphones and tablets, including the Nexus and Galaxy series. The Android will power off and reboot itself, when the screen turns back on you’ll see a little progress bar, and then the phone will restart itself yet again, booting to a freshly formatted Android phone without any personal data stored on the device. 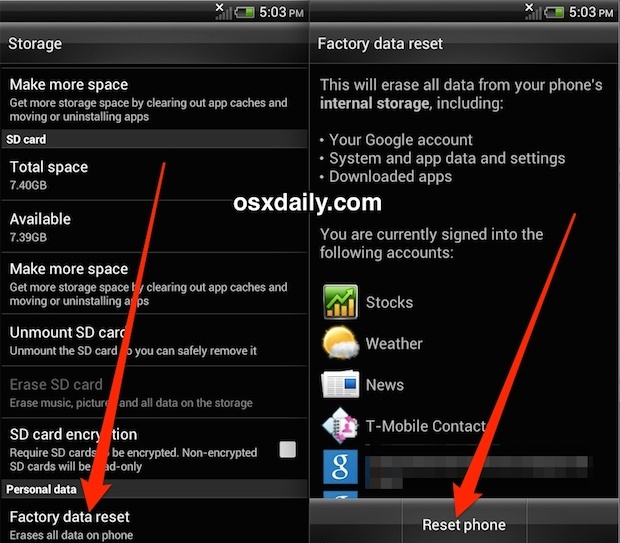 Whichever method you use to format the Android phone or tablet, the device will boot back up and Android will want to start the setup process immediately, so if you’re going to give the phone to someone else, or sell it, then you may want to avoid starting the setup procedure and just pass it off the new owner at this new setup screen. Separately, if the Android phone uses external storage through an SD Card, you may want to erase that storage card or even remove it if you have personal data on there. An entry about android devices?? Many Apple users have Android phones! But anyway, I had to walk through the erase and reset process with someones Android as they were making the move to iPhone, and we get a fair amount of similar questions from Android switchers, so it I figured it was worth covering. There are a lot of Android users out there, some who are switching to the iPhone and some that switched away from the iPhone, or who use both for work or personal reasons. I have Android hardware around the office myself, but tend to stick to iPhones for obvious reasons. Bitt, I totally agree. What is the world is an Android doing on a OS X —— Let me say that again OS X sight. I would consider this and OOPS. Wait, what is an Android doing my homepage? I thought my homepage was OS X Daily lol. Well I use an Android for work that I have to wipe every few months to hand in to get a new one, so this is relevant to me. Of course I have an iPhone Plus for personal use, and multiple Macs too. Many of us use Android, it’s a big market after all! Indeed, we receive a fair amount of questions from people about Android tasks, either relating to how it works with their Mac, or how to move back and forth with an iPhone, so we may cover some of the basics from time to time. So what? Maybe if you will be asked to do the same on Windows installed on Mac you will release Windows news here? I’m offended. This Android guys steal all Steve’s ideas and make cheap copies of his (and Apple team) work and now you going to support it?! If you continue to do that I no longer visit the website again. And there are plenty of websites dedicated to your needs. This site has been all about Apple (until now). Forgive the dedicated readers for feeling a bit pushed aside. Seeing as there are more than enough websites that service android users, I can’t see why you would even think of writing this. Are you changing the name of the site too, or is this the first step in alienating your core readership? Good luck if that’s the case, I’ll simply delete you from my reading list. Watch the ad revenue dive. I have both types of phones. Thanks for helpful tip. Good to know. Many sites post on both platforms. Android has come a long way. Well done! I have operated Macs and Androids for years. I congratulate your wisdom here! I was your reader from the beginning and I lOVE your website, but if you going to release Android news, you’re traitor for me! Open another blog for that, if you want. This is Apple site for us — old good Apple fans. You guys are so racist. Androids are phones too! Thanks for the tip, so many people I know use Android and some are making the switch. Everyone wants to erase their Android data before moving to the iPhone, who wants to leave their personal stuff on a phone they’re going to trade in? Could be embarrassing. This is a useful article, why are all these neckbeards so angry and shocked that other people out there use Android and that we may even use Android AND iPhone? Oh, the humanity! Here’s an idea; if a tutorial is not relevant to you, don’t read it. Complaining about your free tech learning and knowledge email service makes you all sound like a bunch of entitled whiners. What’s next, a tutorial on wiping BlackBerry phones? 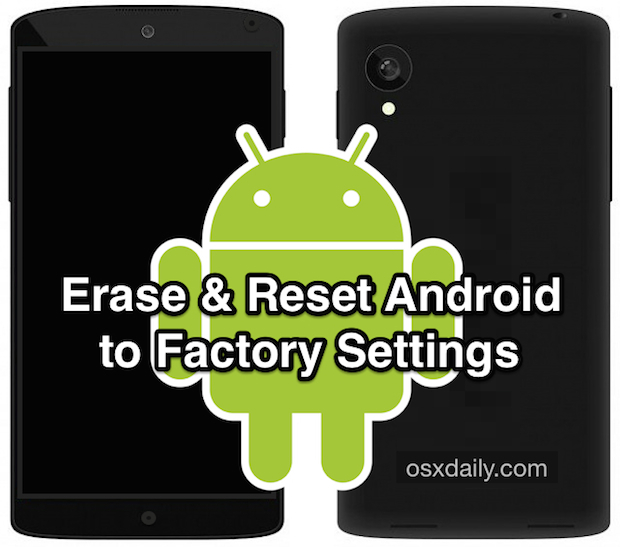 Erasing an Android is basically part of the process of migrating to iPhone from an Android smartphone, which is specifically mentioned in the article. Regarding Blackberry, I’m not sure how many Blackberry users are out there still, but we would certainly cover topics pertaining to migrating from Blackberry to iPhone, especially if we had many user requests about that topic. Anyway, the feedback is appreciated. I understand that many people are very faithful to Apple, to the point where it could be a religion, but there’s no need to get all but hurt about one post about Android. It’s helped a few on here, and even though there are plenty of other sites with this info, it doesn’t hurt anyone to have it here. Get over it folks it’s just I.T. equipment, it’s not your beloved family being forsaken! I think there are far many more comments that were made than that which were approved by moderators. Looks like they don’t care for the criticism :) They know they don’t have a case this time. Yes we try to moderate all comments, particularly if they are off topic, spammy, or unhelpful. Criticism is fine if it’s on topic and not offensive, though general site feedback is better provided through email. If it’s critical about a specific article, in this case formatting an Android device, it should at least remain on topic of the article in question, maybe about moving from an Android to an iPhone and the processes that go with it, or why to use one OS or the other, etc. We get literally thousands of comments everyday day, many of which are spam, outright offensive, illegible, or just so off topic it does not warrant approval. If we did not moderate these comments, it’d be a real mess, take my word for it! Anyway, we always appreciate the feedback, even if it’s people wondering why on earth you’d want to erase data off an old Android! THIS IS FOR APPLE NEWS NOT DIRTY ANDROID. Android? Well, nothing to do here. It was nice while it lasted. Bye.